Weld spatter burn-through is a constant challenge with inductive sensors in automated welding applications. Balluff is pleased to announce an all-new series of inductive flatpack sensors with the active sensing surface made from Fortron, a high-performance polyphenylene sulfide (PPS) material. 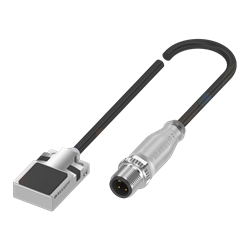 These new BES R01 flatpack sensors help to combat the hostile conditions found in welding environments. "The development of these new welding-oriented inductive sensors is completely market-driven," says Shawn Day, product marketing manager for Balluff. "We at Balluff are constantly listening to the expectations of our customers in the automated welding industry, and they told us that tougher sensors are needed." Typical plastic sensing face materials suffer from erosion and degradation due to repeated impingement of hot weld spatter. The closer the sensor is placed to the welding electrode, the shorter the sensor's life expectancy. The Fortron PPS sensing face on Balluff's new flatpack sensors effectively resists thermal breakdown in hostile welding environments. The new housings having the same form factor as the standard flatpack sensors making installation simple. Equipped with additional features designed specifically for welding applications, Balluff's new Fortron PPS flatpack sensors can help plant operators reduce downtime occurring due to premature sensor failure.